We recently took the plunge and replaced Cora’s crib-turned-toddler-bed with a “big bed” and it has been the most darling thing I’ve ever seen in my life. There was a lot of talk around our house about the “big bed” coming and we decided that we’d make a deal with Cora. She had recently potty trained, but we had yet to get rid of her pacifier – and she was starting to get downright ridiculous about it, despite not wanting to take one as an infant. So we made a deal: give up the paci, get a big bed. If you follow me on Pinterest, you might have noticed the beds I pinned for her. I wanted something white or shiny, super-affordable, and with a classic look. I had been scouring Craigslist and found a few potentials, but the one I really wanted sold just before I was able to arrange to pick it up, another was priced over what I could get a new, similar one for, and the rest needed a ton of work. I had never ordered from Wayfair before and the one-and-only picture was, left’s face it, crap. But, the price was right at $162 shipped to my door after a 10% off coupon for signing up for their email list. There were no reviews on this particular bed, but there were glowing reviews of beds by the same manufacturer and finish, so I went for it. With a tracking number to stalk, we had a date. Cora went to school and told everyone she was getting a big bed. When I picked her up from school, she greeted me with “BIG BED!! !” instead of “Mama!”. She talked about it all the way home. Fedex still hadn’t made it when we got back home so she and to nap in her “little bed”, but I told her her big bed was coming any minute and she would get to sleep on it that night. It is slightly different from the picture, but I love it. I think it’s nicer with the added details. This is where you need to do me a favor and ignore the curtain, because that part of the make-over will need it’s own post, but we’re technically only half-way through this project (working in it!). We moved her chandelier over since her big bed is in a new spot, partly so we could leave the “little bed” in there just in case. 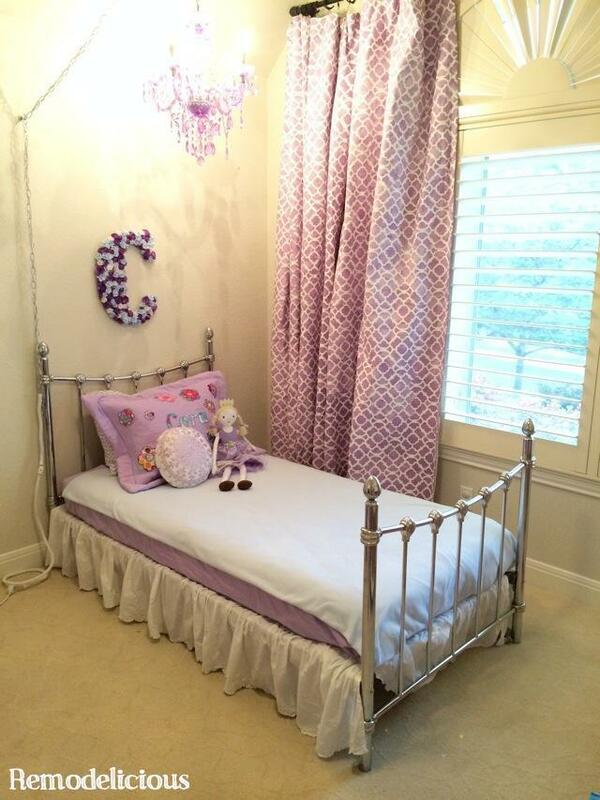 We also hung the floral “C” I made and Cora picked her sheets and bedskirt herself at Target on a special shopping trip – which really made the “big bed” event that much more special for her. The sheets are Circo and the bedskirt is Simply Chic. We opted to not use a box spring so she would be lower to the ground (in case she falls out). That took a small adjustment to the bedskirt, but I like the look for a little kid’s room and it’s more functional for her. Initially, I smashed an extra crib mattress between the window & the bed and put her generic toddler-bed conversion kid on the front side of the bed. Really, she didn’t need it and asked me to take it all off after only a few days. Works for me, it’s so much cuter without the bed rail. There are many more updates coming for Cora’s room including a custom quilt and some more details for the wall, but we’re working on this transformation one step at a time. I love the retro look to the bed and the chrome finish is so beautiful with the lavender and blue that she wants for her room. 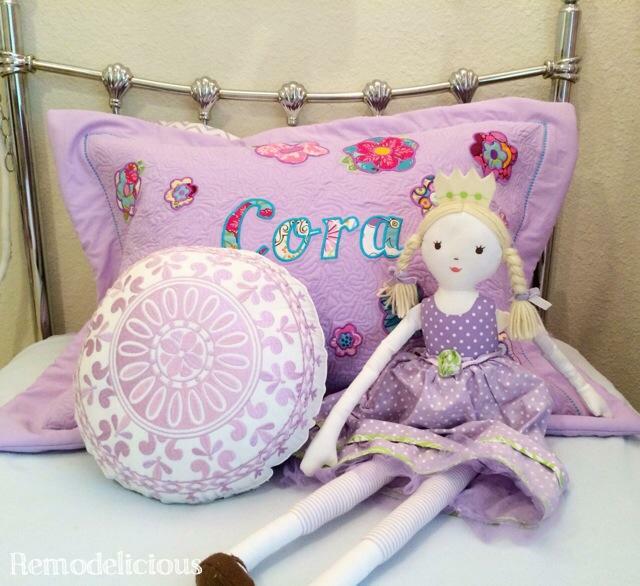 I made the pillow sham and I’ll tell you all about it next post! Cora loves that all eyes are on her room for a chance and is eating it up! Hi, I am considering getting this bed to use as a daybed to use with this cover (http://www.potterybarn.com/products/cameron-organic-matelasse-daybed-cover/) so it is a bed/couch. Are the headboard and footboard the same height.? I thought it looked that way in the photo, but I wasn’t sure. 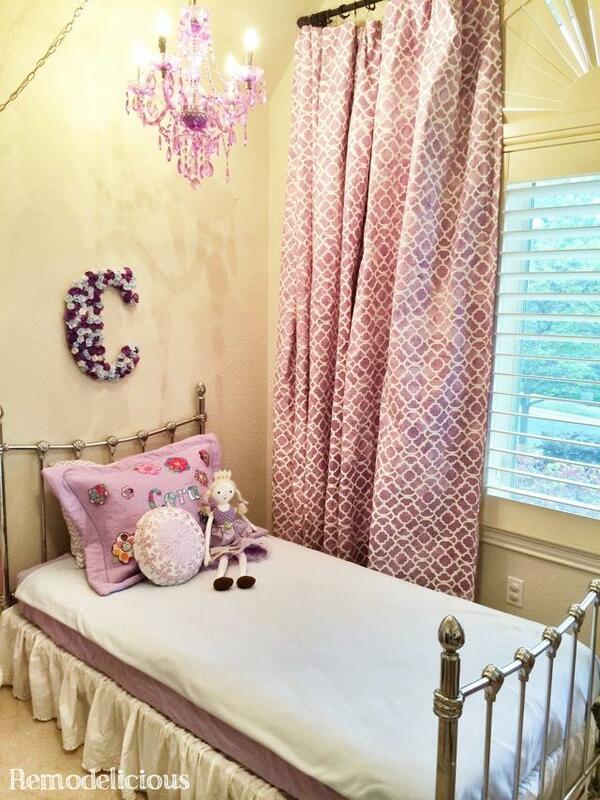 Nice job on your little girl’s room. The headboard on this bed is taller than the footboard by just a bit so you may not love it as a daybed.